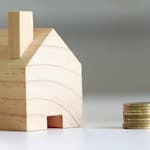 CBC Radio: Q the Decline? CBC is like a crazy, old aunt, unwilling to accept the reality of her circumstances. In CBC's case it is the reality that its radio audience is comprised mostly of older Canadians. CBC senior managers have recently boasted about the record high audiences of CBC Radio. So the decline in CBC Radio and the real audience story have been covered up, along with the serious negative effects of disproportionate budget cuts. Meanwhile managers continue to ignore how people use radio, going after the younger, hip audience that long ago abandoned radio for other media choices. CBC is like a crazy, old aunt, unwilling to accept the reality of her circumstances. In CBC's case it is the reality that its radio audience is comprised mostly of older Canadians. CBC senior managers have recently boasted about the record high audiences of CBC Radio. They gush over CBC Radio's audience share in speeches and public appearances, such as last month's appearance before a Senate Committee, but never acknowledge that loyal, senior citizen listeners are responsible for creating a mathematical illusion. Mark Twain would say there are lies, damn lies. While CBC Radio is undoubtedly the jewel in CBC's crown and virtually a necessity for a large number of Canadians, managers have been close to deceitful about its audience performance. Why? As reported elsewhere, CBC managers have scooped over $100 million (about 30 per cent) from the annual budgets of CBC English and French Radio over the past six years. CBC TV has had its budget spared in comparative terms. This has crippled CBC Radio: many programs have disappeared and been replaced with repeats of the remaining programs; radio staff has been cut by 20 per cent. while TV has lost but 3 per cent; local noon hour shows have been reduced to one hour ; local morning shows now constantly repeat sports, weather and traffic information and fill airtime with syndicated segments which were once occupied by local reporters and serious discussion of local issues. Radio staff do their best with much reduced resources. What better way of deflecting criticism of all these cuts than to tout the audience success of the hollowed out service? But a careful review of the data CBC released to the Senate shows CBC Radio's audience is not at record levels. CBC Radio 2 has been turned into a service with a split personality. It once was a classical music and arts service but about the time budgets were being gutted, it became a strange mélange of classical and contemporary music. For the first time since the 1970s commercial advertising was introduced. Radio listeners on average only tune to a handful of stations in any given week, as few as three, and they expect the programming 'format' to be consistent whenever they tune to a particular station. This is Radio 101. The split format of Radio 2 goes against established programming strategy and likely satisfies neither old nor new listeners. Apparently it hasn't satisfied advertisers either, since ad revenue has been disappointing, pulling in a fraction of what was anticipated. CBC Radio 1, which is primarily news and information, has suffered most of the massive budget cuts. 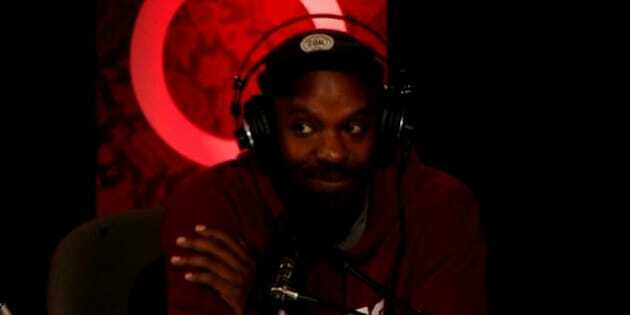 It just announced that one of its flagship morning shows, Q, will be hosted by Shad, a rapper, and the program will feature more music and try to attract younger listeners. All music has a place but in an important time slot on Radio 1? Does it signify another break with reality and blindness as to who really listens to CBC? I have no explanation for these counter-intuitive programming decisions but I once heard the president of CBC, Hubert Lacroix, declare at a luncheon speech that his mother liked the music on Radio 2 rather than citing audience research. CBC Radio is not for everyone. But about one in three Canadians listen to CBC Radio for at least an hour per month, according to our surveys. That is a very substantial plurality, as many as vote for the winning party in federal elections. Those who listen regularly are intensely loyal and spend many hours a month with the service but is the audience growing, as claimed by CBC? 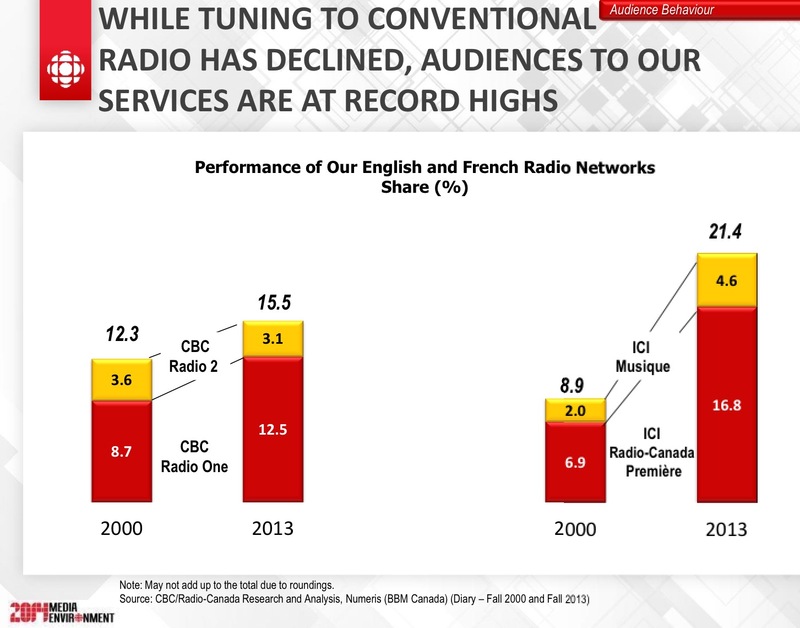 Radio listening overall has been declining since 2000, according to ratings data CBC provided to the Senate. 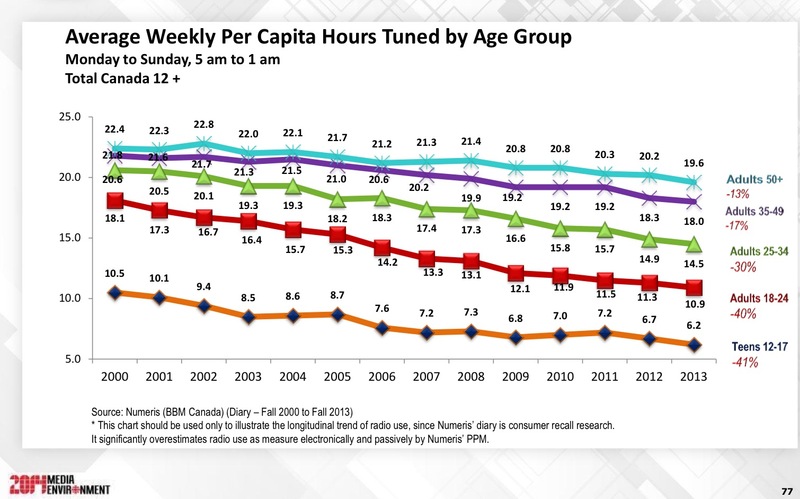 Within some age groups weekly average hours spent with radio have declined by as much as 40 per cent (see graph below), as people, especially younger people, are turning to other alternatives to listen to music, including iPods, smartphones, Internet streaming, etc. 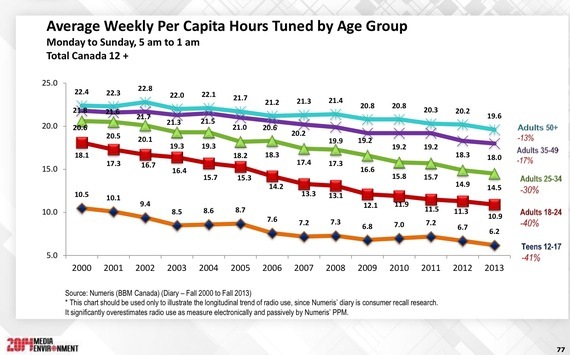 However, when CBC claims that its audience is at record levels, it doesn't use average hours spent with CBC Radio. Rather it switches to another metric, audience share. Yes, the CBC share has grown since 2000 but the base for the calculation of share, hours spent listening, is down by as much as 40 per cent. The CBC share has increased because many non-CBC listeners have abandoned radio for other music alternatives, while CBC's mostly older, beleaguered listeners have stayed with CBC despite the diminished service. In effect, CBC has a larger share of a much smaller pie. Again, Twain would say reports of an increase in CBC Radio's audience are greatly exaggerated (and the result of demographic trends, especially an aging population). Among older adults, who are the heaviest radio listeners, as shown in the graph, CBC Radio registers more than a 33 per cent share, while among younger adults, who are lighter radio listeners, the share is less than 10 per cent . Despite the stunning fact that one third of all seniors' listening is captured by CBC Radio, managers are loath to acknowledge that it is overwhelmingly a service for older persons, a group that will only get larger. So the decline in CBC Radio and the real audience story has been covered up, along with the serious negative effects of disproportionate budget cuts. Meanwhile managers continue to ignore how people use radio, going after the younger, hip audience that long ago abandoned radio for other media choices. Poor auntie Bee denies it and withdraws into fantasy.